The Prime Minister and provincial premiers have the power to give jobs to whomever they want to run government agencies that enforce laws (including the courts), and run government programs. Thousands of people are hand-picked by the PM and premiers in secret, without any review or checks on their power – they even get to choose the people who enforce the laws that require themselves, and their Cabinet ministers, to be honest, ethical, open and waste-preventing! Politicians in cities and towns across Canada also get to choose their own watchdogs. This has to stop – unchecked patronage appointments and cronyism that puts unqualified people into powerful, important government jobs hurts our democracy and wastes our money. And it can be stopped – more than 20 years ago the Ontario government set up a mostly independent committee to find qualified people to serve as judges (although even Ontario’s committee can be improved because a majority of members are still selected by the government). And the UK government has an independent committee that finds qualified people to be judges, and also the heads of agencies, boards, commissions and tribunals that enforce laws. Every government in Canada, federal, provincial, territorial and municipal, should set up a fully independent, merit-based appointments committee. The Trudeau Liberals are deciding right now whether to keep their election promise to stop patronage and cronyism and ensure merit-based Cabinet appointments for federal government jobs. Please help ensure the Liberals keep their promise by sending your letter now. Across Canada, patronage and cronyism is a big problem – ruling party supporters and donors who are often not qualified get appointed to important government jobs, while qualified people are shut out. 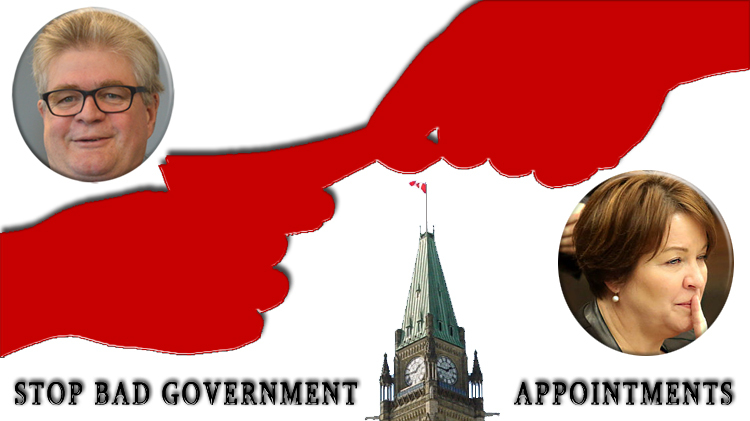 In 2006, Prime Minister Harper promised to stop patronage appointments and cronyism by setting up an independent appointments committee. But he broke that promise – he appointed more than 1,000 Conservatives to key government positions, including top Conservative donors and fundraisers to the Senate. When he was Prime Minister, Jean Chretien did the same, giving jobs to hundreds of Liberals. The Liberals under Justin Trudeau have set up a new process for appointing senators – but Prime Minister Trudeau appointed all the members of the search committee and he can still choose anyone he wants to be a senator. NDP governments in several provinces have made similar patronage and crony appointments. Even the process for choosing judges for the Supreme Court of Canada is controlled by the Prime Minister – it is very dangerous to allow the Prime Minister to control the court of last resort for anyone trying to stop government abuse. Thousands of people are hand-picked by the PM and premiers in secret, without any review or checks on their power – they even get to choose the people who enforce the laws that require themselves, and their Cabinet ministers, to be honest, ethical, open and waste-preventing! This has to stop – unchecked patronage appointments and cronyism that often puts unqualified people into powerful, important government jobs hurts our democracy and wastes our money. And it can be stopped – 20 years ago the Ontario government set up a mostly independent committee to find qualified people to serve as judges (although even Ontario’s committee can be improved because a majority of members are still selected by the government). Every other government in Canada – federal, provincial, territorial and municipal – should follow Ontario’s lead and set up their own fully independent, merit-based appointments committee. Patronage and cronyism that is damaging democracy and law enforcement across Canada will only be stopped by setting up fully independent appointment committees that choose, through a public, merit-based process, a short list of the most qualified people for each government job, and by requiring governments to give one of the people from the short list the job.